This gallery presents nearly 200 images from the collection of Dr. Edward Alpheus Bass. Bass was a practicing physician in Montello when he purchased a Velox camera from the local newspaper office in 1892. 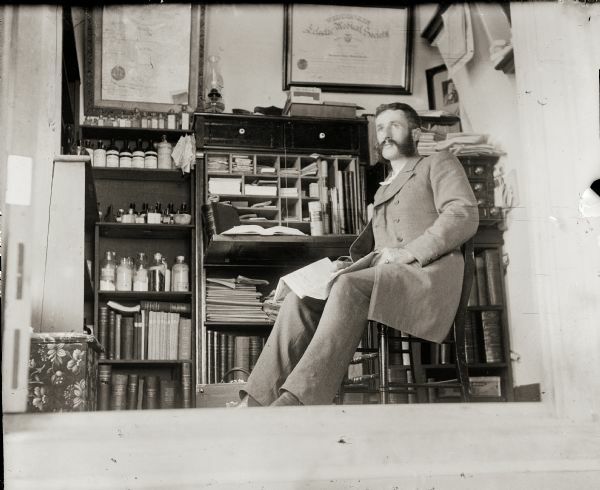 The newspaper, the Montello Express, reported that Dr. Bass had "no experience in photography, but during the week has taken a number of most perfect pictures." More than 130 of his negatives, photographs, and digital images, circa 1885-1910, are preserved on glass negatives donated to the Society by his son. 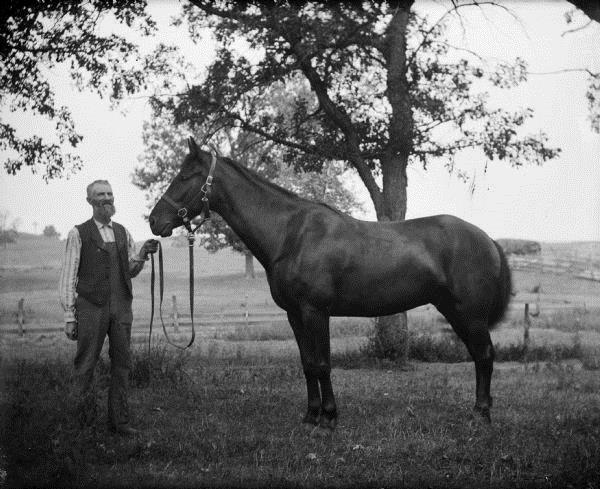 Leroy Burlingame and Dan the Horse, 1895 ca. The key innovations of Velox cameras were portability and the elimination of the professional photographer. Although the Bass photographs comply with many conventions of the day in terms of subject matter and composition, there is a relaxed intimacy about them because of the relationship of the photographer to his subjects. That relationship either didn't exist with a professional photographer, or was strained by the cumbersome technology or the unfamiliar studio setting. 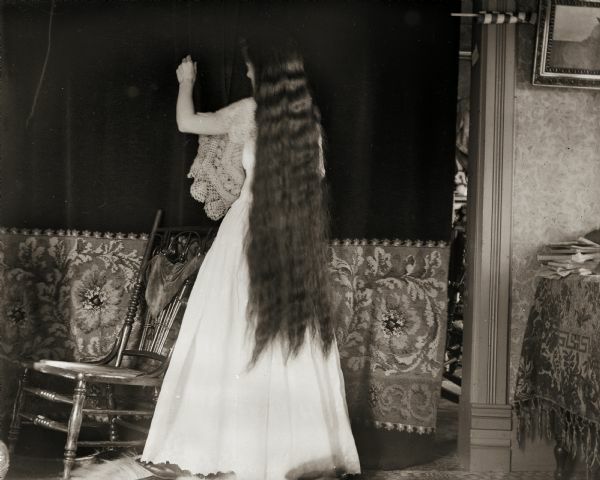 A respectable woman would not let her hair down in front of a stranger in a studio, but Dr. Bass could photograph his wife's beautiful long hair in the privacy of their home. And his group photographs have a very natural quality despite being carefully posed. The Bass collection reflects historical trends and how they affected the small city of Montello and its citizens. The photographs are at once specific to that place and general. They are not journalistic representations of what might be commonly considered "historically important" events, but provide a clear view of times and places that have since proved important. Montello bicyclists were part of a nationwide cycling craze, which led to the demand for better roads; the many displays of the American flag in the home and at gatherings of all sorts attest to the strong strain of patriotism through the 1890s. Women and Young Girl Leaning on Fence, 1897 ca. The photographs also document the travels and activities of Dr. Bass himself. He was a railway surgeon for the Wisconsin Central Railway and thus entitled to free rail travel, so there are photographs from the Ashland and Bayfield and Wisconsin Dells areas. Family ties and medical meetings took him to Milwaukee, where he photographed City Hall as it neared completion. His family scenes are not the somber portraits typical of the time, but show people sitting or standing naturally. Bass' images capture the scenic beauty of Marquette County lakes and rivers, as well as views throughout Wisconsin and provide a rare look at family, social and political events of the time through the eyes of one of the participants. Edward Alpheus Bass was born September 24, 1860, in Cedar County, Iowa. His father, Isaac W. Bass, a farmer from Vermont, had arrived in Iowa in 1854. Edward attended school in the Sauk Prairie area and graduated from Lodi High School. He attended Bennett College of Eclectic Medicine and Surgery in Chicago. He established a practice in Burnett Junction, Wisconsin, described as a "railroad post town," that same year. The Chicago, Milwaukee & St. Paul and the Chicago & North Western Railways crossed at the junction. In December 1884 Edward Bass married Ada Mae Burlingame of the Town of West Point, Columbia County. Ada and Edward lived in Burnett Junction for three years, and moved to Montello in 1887. Dr. Bass delivered his daughter, Everetta, on August 14, 1889. 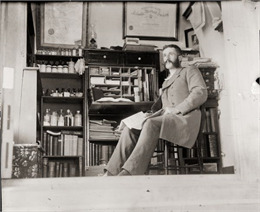 Edward A. Bass in his Platt House Office, 1900 ca. During his years in Montello, Dr. Bass served as village health officer and director of the school. He was active in the Republican Party, known then for its progressive ideology. He was particularly involved in the 1896 elections and was rewarded with the position of Montello Postmaster in 1897. He continued as postmaster until he became disabled in 1912. During that time, the Montello Post Office instituted Rural Free Delivery and Dr. Bass oversaw the establishment of four rural routes and tested the candidates for the mail carrier positions. He also served as railway surgeon for a segment of the Wisconsin Central Railway. Dr. Bass was descended from a long-established New England family. Dr. Bass stayed in touch with his relatives and brought the family genealogy up to date. He published a chart outlining the history of the Bass family in America; the chart is in the collections of the Wisconsin Historical Society, the Library of Congress, the New York Public Library and other institutions. Dr. and Mrs. Bass traveled widely, to visit friends, attend meetings and conventions, and occasional plays in Chicago. They made two extended visits to the World's Columbian Exposition (World's Fair) in Chicago in 1893. Dr. Bass became disabled in 1912 and died in 1916. After his death, Ada divided her time between Montello and the homes of her son and daughter. She died in 1957. Edward and Ada Bass are buried in Garden Bluff Cemetery in the town of West Point, not far from Ada's childhood home.